Get Ready for Zoya Awaken: Spring 2014 collection! •Dillon: Green Mint Shimmer Metallic Full Coverage Formula. •Rebel: Blue Sky Shimmer Metallic, Full Coverage Formula. •Hudson: Purple Orchid Shimmer Metallic, Full Coverage Formula. •Dot: Pink Petal Cream, Full Coverage Formula. •Cole: Peach Whisper Cream, Full Coverage Formula. •Brooklyn: White-Gold Shimmer Metallic, Full Coverage Formula. These colors will retail for $9.00 USD each. 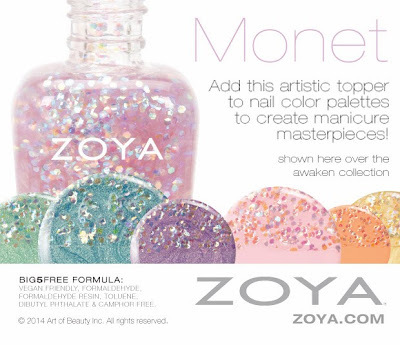 • Monet: Multi-Color, Cellophane Holographic Topper. Monet will retail for $10.00 USD. What do you think of the Spring 2014 Awaken collection? I think I'm most excited for Dillon, Rebel, Hudson and the Monet topper! The Awaken Collection will be available on Zoya.com, early spring.